Travelers on British Airways and its sister airlines in Spain face a third day of delays and cancellations, mainly on short-haul flights in Europe, after the company suffered a colossal IT failure over the weekend. British Airways said it would take steps to ensure there was no repeat of a computer system failure that stranded 75,000 passengers over a holiday weekend and turned into a public relations disaster. BA had been forced to cancel all its flights from Heathrow, Europe's busiest airport, and Gatwick on Saturday after a power supply problem disrupted its operations worldwide and also hit its call centres and website. The airline was returning to normal on Monday, planning to run more than 95 per cent of flights from London Heathrow and Gatwick, with only a handful of short-haul flights canceled. CEO Alex Cruz said the root of the problem, which also affected passengers trying to fly into Britain, had been a power surge on Saturday morning which hit BA's flight, baggage and communication systems. It was so strong it also rendered the back-up systems ineffective, he said. "Once the disruption is over, we will carry out an exhaustive investigation into what caused this incident, and take measures to ensure it never happens again," Cruz said. Over the weekend, some stranded passengers curled up under blankets on the floor or slumped on luggage trolleys, images that played prominently online and in newspapers. The company was left counting the cost of the disruption, both in terms of a one-off impact to its profit and the longer term damage to its reputation. Spanish-listed shares of parent company IAG, which also owns carriers Iberia, Aer Lingus and Vueling, dropped 2.8 per cent on Monday after the outage. The London-listed shares did not trade because of a public holiday. Flight compensation website Flightright.com said that with around 800 flights canceled at Gatwick and Heathrow on Saturday and Sunday, BA was looking at having to pay around the equivalent of $68 millionUS in compensation under EU rules. That does not include the cost of reimbursing customers for hotel stays. BA would fully honor its compensation obligations, Cruz said. Of the 75,000 passengers who missed out on flights, around two-thirds would have been flown to their destinations by the end of Monday, he added. BA has been cutting costs to respond to competition on short-haul routes from Ryanair and easyJet and recently faced criticism for starting to charge passengers for their in-flight snacks. Ireland's Ryanair was quick to seize on the marketing opportunity, tweeting "Should have flown Ryanair" with a picture of the 'Computer says no' sketch from the TV series Little Britain to poke fun at BA. Ryanair said it had seen a spike in bookings over the weekend but gave no further details. The GMB union said that BA's IT systems had shortcomings after they made a number of staff redundant and shifted their work to India in 2016. "This could have all been avoided. 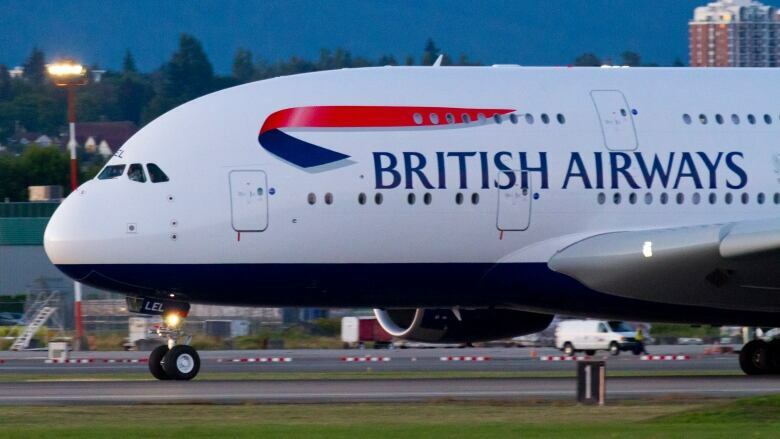 BA in 2016 made hundreds of dedicated and loyal IT staff redundant and outsourced the work to India," Mick Rix, GMB National Officer for Aviation, said. "They've all been local issues around a local data center, which has been managed and fixed by local resources," he told Sky News. Several passengers complained about a lack of information from BA staff at the airport. Others said their luggage had been lost. The airline said it was working to get reunite passengers with their luggage after many items were left at Heathrow over the weekend, although staff on Twitter warned this "could take some time". While other airlines have been hit by computer problems, the scale and length of BA's troubles were unusual. Delta Air Lines Inc canceled thousands of flights and delayed many others last August after an outage hit its computer systems. Last month, Germany's Lufthansa and Air France suffered a global system outage which briefly prevented them from boarding passengers.